I think we all recognize this iconic little kitty. (Although she's apparently a little girl?) Cat, human, whatever she may be, she's been around for 40 years and even though this isn't specifically Valentine's Day themed, it's pink and red with hearts, so what better time to review it than now? This is a novelty product, so the main selling point is the packaging. They want to sucker us all in with that iconic Sanrio-cuteness, and you know what? It totally works. (It got me and I'm not even a big Hello Kitty fan.) We have a bunch of adorable Hello Kitty illustrations scattered on a resealable foiled plastic pouch containing a small amount of candy. 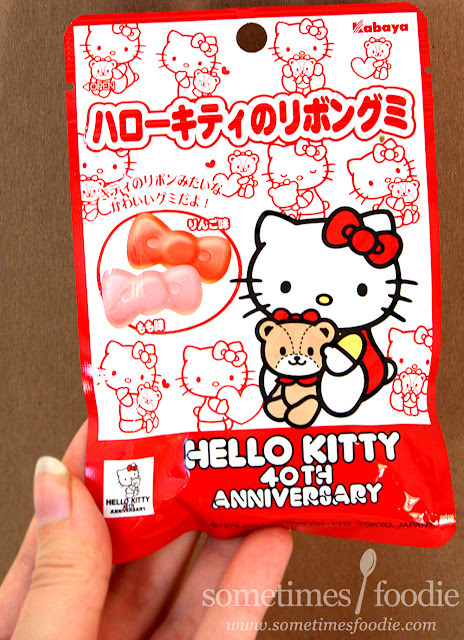 It's adorable, collectible, and the gummies themselves are shaped like Hello Kitty's iconic bow so you get a double whammy of cuteness. 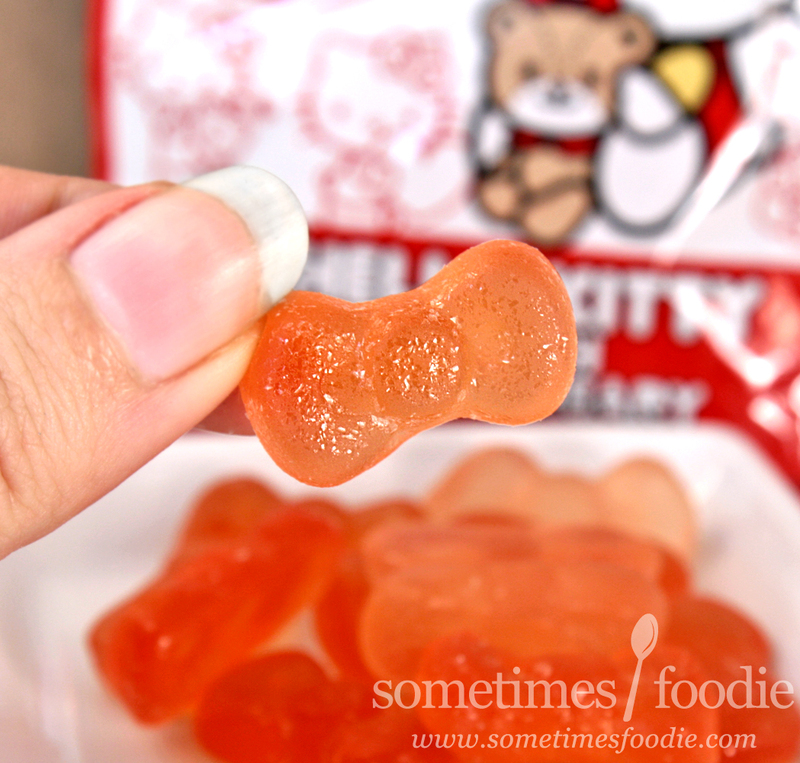 Speaking of the bow shaped gummies, they're really cute, but they have this weird edible-glitter-like coating that I don't understand. Is it intentional? Or are these coated ina little too much food-grade wax? It's kind of neat, like they're coated in clear glitter, but these could just be old or something. I can't really tell. Peach (translucent pink): Once you get through the weird waxy coating, the gummi tastes very sweet and mild. It's a bit on the floral side of things, but it tastes a lot more realistic than other peach flavored candies I've had in the past. 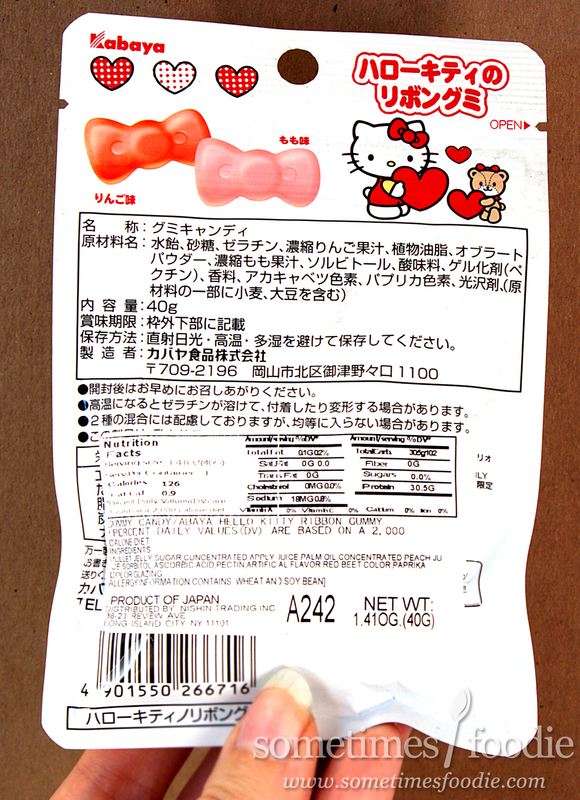 (I still think the Kasugai gummies are better, but there aren't half bad.) It's enjoyable, and not bad for a novelty product, but I know I can get better peach flavored gummies elsewhere. Apple (translucent redish-peach): Again, once you get through that weird waxy outside, the flavoring is pretty nice. These apple gummies are tangy and more concentrated than the peach, and it's almost like they took apple juice concentrate and turned it into a gummy candy. I like this one more than the other, but you don't get that many in this bag, and it's pretty pricey, but this flavor is on-par with Kasugai's. 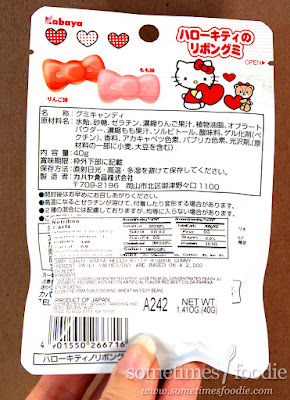 This is a really cute novelty product for fans of Hello Kitty, and the flavoring is more authentic than a lot of gummies on the American market, but the portion size is really small and these are pretty expensive. 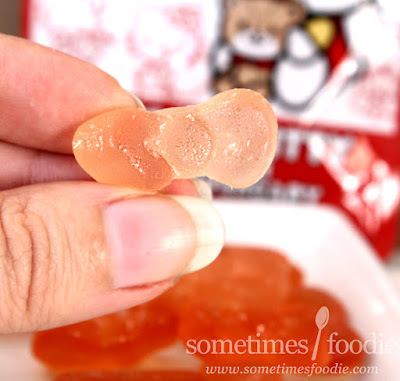 If you're looking for delicious fruity gummies to snack on, and you want to spend a little money, I suggest getting Kasugai ones instead. However, if you're looking for an edible gift for a Sanrio fan, these are pretty gppd for a novelty product and I don't think anyone would dislike them.